Explore life in the great outdoors with the Adventure Tree House. Located in the heart of the forest, this house is surrounded by all sorts of wildlife. Watch as a mother bear and her cub fish for their dinner while a fox family plays nearby. Just beware of the weak spot on the bridge or you might fall through! Both a bald eagle and owl have made a home in the branches above the tree house, giving kids an up close and personal nature experience. The adventurers can use their equipment to learn more about their animal friends and help protect the environment. Use the pulley system to lift some of the heavier supplies up to the house. At the end of the day, keep wild visitors out by pulling up the stairs. 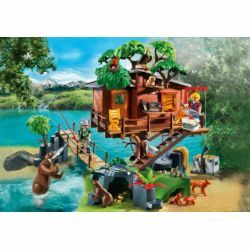 Set includes two figures, tree house with grass platform, bears, geese, foxes, owl, bald eagle, bird with nest, rock caves, fish, fishing pole, snake, walkie talkie, computer, supply boxes, and tons of other accessories.